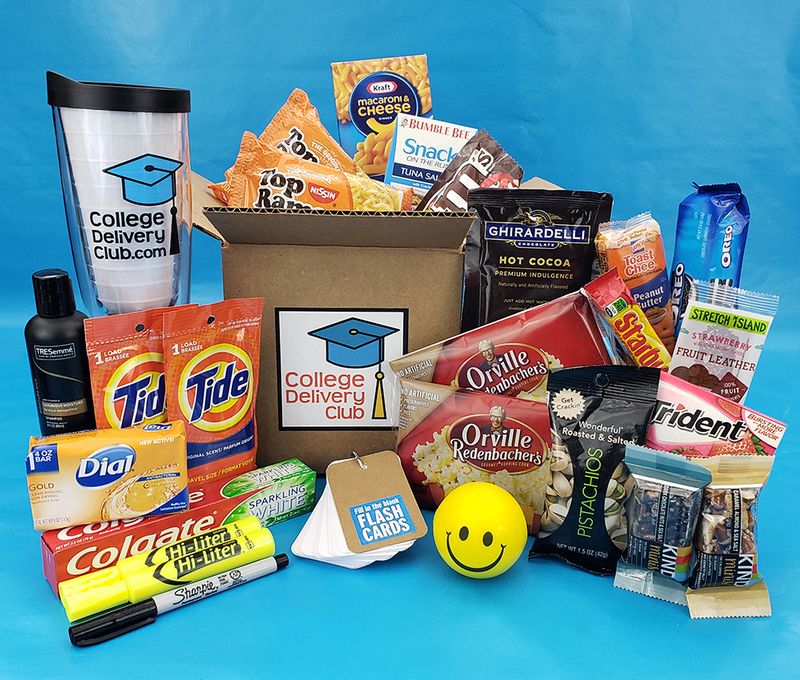 Our college-student advisors have told us what they want in a finals week box, and here it is! $45 includes everything you see in the picture, a personalized gift message and shipping, too! You can help make finals week less stressful and more successful with this great end-of-semester boost for your college student! We will start shipping finals week boxes on May 1 and continue taking orders until they're gone. Click "This is a gift" in your cart to enter your gift message and your student's shipping address. There are 26 items in the box, PLUS a bonus item! Nissin chicken flavor ramen, 2 packs. Because...ramen. Kraft mac & cheese. A college classic! Bumble Bee tuna salad kit. Great for a grab-and-go meal. Wonderful pistachios. Add fruit for a great lunch! Kind bar minis. Try two flavors! Redenbacher popcorn, 2 bags. For a study snack or a Netflix break. M&Ms. When it's gotta be chocolate. Oreo cookies. Take a bite, or twist apart? Lance peanut butter crackers. And old-school guilty pleasure. Trident berry lime gum. Sweet and tart. Ghirardelli premium hot chocolate mix. A late-night treat. Colgate sparkling mint zing toothpaste. Keep smiling! Dial gold soap. For a wake-up shower before that 8 o'clock class. Tresemme shampoo. Enough to last until semester break! Tide laundry detergent, 2 loads. Laundry happens, gotta deal. Hi-Liters. A must-have for finals week! Blank flash card kit. The ultimate customized study guide. Sharpie marker. To fill out those flash cards. Bonus item! A College Delivery Club traveler tumbler.